Coconut Catapult Activity Toy is rated 4.4 out of 5 by 5. We are cocoNUTS about this laughter-launching toy. It only takes 2 easy steps to make this ball popper send colorful coconuts flying through the air. Load the ball into the gorilla’s hands. Then bop the palm tree as hard as you can to see it woosh off into the distance… and watch as your kiddo’s smile grows wide. 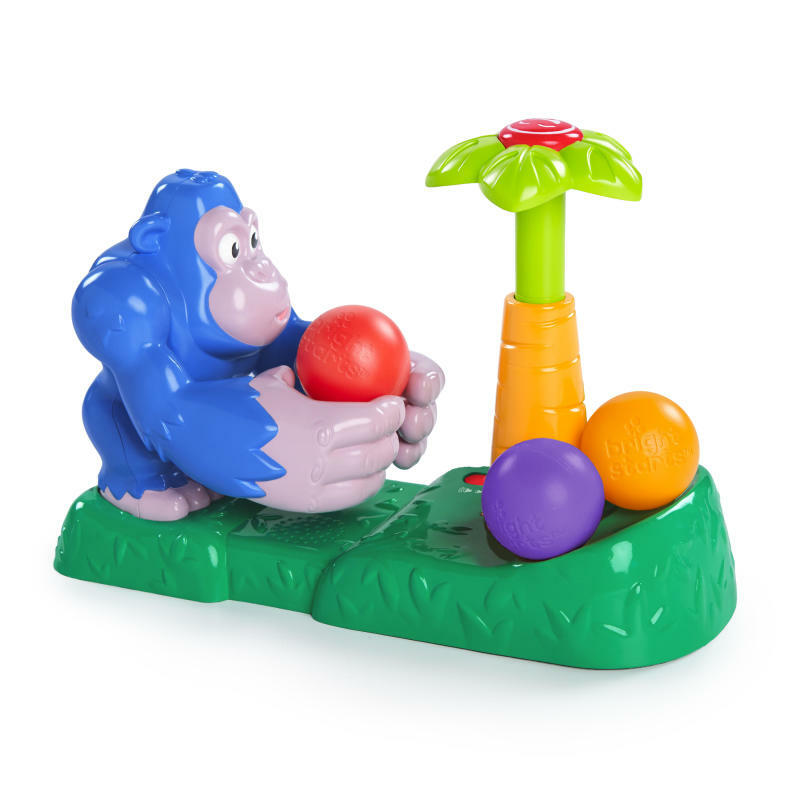 With 25 melodies and silly sounds, this toddler toy from Bright Starts will catapult your little monkey into a fit of giggles. Load, bop, launch & burst into giggles and grins! Dimension (in) 5" x 11.5" x 8.5"
Rated 4 out of 5 by Jill1234 from Fun For The Whole Family I have three young kids (ages 2 months to four years old) and it was fun for everyone. While I think it is ideal for a younger toddler, my two older kids enjoyed the music and seeing how far they could launch the ball. One thing they did tell me was that they wish it could catapult just a little bit further. Sometimes it barely made it out the holder when they pushed down on the tree. My youngest enjoyed the bright colors and movement that the toy created. I think if the ball went a little farther, they would play with it for a little longer each time. I also let my six month old godson play with it and he had fun trying to figure out how to get the ball to move. Rated 5 out of 5 by Sierra94 from Awesome toy This toy is just awesome. My 2 year old granddaughter has a sensory disorder and this toy she is loving. It’s offering her loads of play time. Rated 5 out of 5 by Sierra94 from Awesome toy This toy is just awesome. My 2 year old granddaughter has a sensory disorder and this toy she is loving. It's offering her loads of play time. Rated 4 out of 5 by Naty1223 from Cute This gorilla is so stinking cute. My kids were so amazed every time the ball was thrown up. My 2 year loved this gorilla she carried it everywhere she went. I am really glad I received this product and would recommend it to any toddler.